Citation: Pérez IS T, Corena AG, Vergara ACZ. Myocarditis Associated with Influenza Virus B in Pediatric: A Case Report and Literature Review. J Pediatr Care. 2017, 3:1. Acute myocarditis is an uncommon manifestation of numerous viral infections with a broad spectrum of symptoms and clinical manifestations. The prevalence of myocardial involvement in influenza virus infection varies from 0% to 11%, varying according to the diagnostic criteria used. The clinical presentation of patients with H1N1 influenza has been specifically described, with little reference to the myocardial compromise that occurs during the course of this disease. Etiologic agents of viral myocarditis include enterovirus, adenovirus, parvovirus, hepatitis C virus, human immunodeficiency virus, influenza, and others. Coxsackie B virus has been described as the most common pathogen of viral myocarditis and hepatitis C virus; However, myocarditis due to influenza virus is infrequent. Myocarditis is characterized by an inflammatory disorder caused by myocyte necrosis and inflammatory infiltrate in the myocardium. The host immune response may play an important role as well as direct cytolysis by viral infection. Its diagnosis is usually incidental, so the true prevalence of it is unknown. This complication occurs with the sudden onset of cardiac symptoms, usually manifested by non-specific, flu-like symptoms with rapid hemodynamic deterioration and potentiallyfatal cardiac complications. In pediatric patients, fulminant myocarditis accounts for 30-40% of cases of myocarditis and has a mortality rate of up to 48%. Influenza A virus subtype H1N1 has been described due to the 2009 pandemic, playing an important role in the pathogenesis of acute myocarditis however, there are few reported cases of myocarditis due to influenza virus in the literature especially in pediatrics. In addition to the exceptional case of myocarditis associated with influenza B, the objective is to present the clinical case and a current review of the subject taking into account the lack of information on this pathology in our medium . A 3-month, 5-day-old boy visits a first-level institution with a three-day clinical course characterized by abundant liquid stools that are not quantified, without mucus or blood, given ambulatory management with oral rehydration salts and antibiotics, with worsening of the table so he again visits the health center where he presents respiratory difficulty that does not improve the management established and therefore refers to the urgency of the Infant Hospital Napoleon Franco Pareja. The patient on admission to this institution is in poor general condition dehydrated and in respiratory failure with high flow oxygen device (ventury). The physical examination of income is vital signs Fc: 150 x min, Fr: 30 x min , TA: 60/40 mmhg, Tº 36 SO2: 80% Weight: 5.50 kg, Size 70 cms, Glasgow 10/15, on physical examination are dry mucous membranes, decreased vesicular murmur in left hemithorax, occasional roncus, With episode of apnea, hepatomegaly 4 cm below the costal ridge, distal cold full capillary of 4 seconds weak pulses, hypoactive, plaintive, is assured airway by initiating intubation sequence and indicate replacement of intravenous fluids, has cardiac arrest on two occasions Requiring cardiac and inotropic massages recovering frequency. On suspicion of sepsis of gastrointestinal origin and respiratory symptoms, it was decided to start treatment with broad spectrum antibiotic therapy and transfer to PICU. In PICU the patient enters in bad general conditions with orotracheal intubation, with vital signs: Fc: 161 × min, Fr: 25 × min, TA: 75/47 mmhg, Tº 36 SO2: 67% Weight 5.50 kg, Glasgow 7/15 palmoplantar coldness, capillary filling 5 seconds, hypotensive, tachycardic, under inotropic support, the pulmonary part on the physical examination is auscultated occasional sibilantes and roncus in both lung fields, new bolus of crystalloid is administered, the inotropia is readjusted With which it improves perfusion, in the paraclínicos show anemia it is decided to transfuse packaged red blood cells accompanied by prolongation of coagulation times it initiates correction with plasma and vitamin k.
Patient who attends with compensated shock- Double inotropic support with adrenaline + milrinone, complying with antibiotic scheme with ceftriaxone, a positive Influenza Virus B antigen report is received so that oseltamivir is initiated and isolation is indicated. On enlarged cardiac chest X-ray, an echocardiogram is indicated (Figure 1). Figure 1: (A): It is observed an enlarged cardiac silhouette of size, besides increase in the plot for bilateral spinning in congruence with pulmonary hypertension. (B): It is observed as there is a significant decrease of the cardiac silhouette in relation to the right heart. A color doppler echocardiogram is performed, which concludes left ventricular dilated cardiomyopathy with 23% EF, no congenital defects, moderate mitral insufficiency due to ring dilatation, indirect signs of pulmonary hypertension calculated by it of 51 mmHg. Patient in intensive therapy, under hemodynamic and ventilatory support, maintaining acceptable oxygen saturations, with signs of good perfusion preserved. It complies with an antibiotic treatment regimen with third generation cephalosporin and antiviral (Oseltamivir) . On day 6 of them stay in the intensive care unit, the patient continued with cardiomyopathy with 23% FE, observed in the cardiac monitor with wide QRSs with a questioned presence of D wave, and episodes of paroxysmal supraventricular tachycardia of seconds Infusion with amiodarone at 5 mg/kg/min is initiated and electrocardiogram and echocardiogram are requested; In the echocardiogram in the DII shunt ventricular extrasystoles are observed (Figure 2). On the echocardiogram of control cardiomyopathy with EF of 28%, moderate mitral insufficiency and no pericardial effusion. 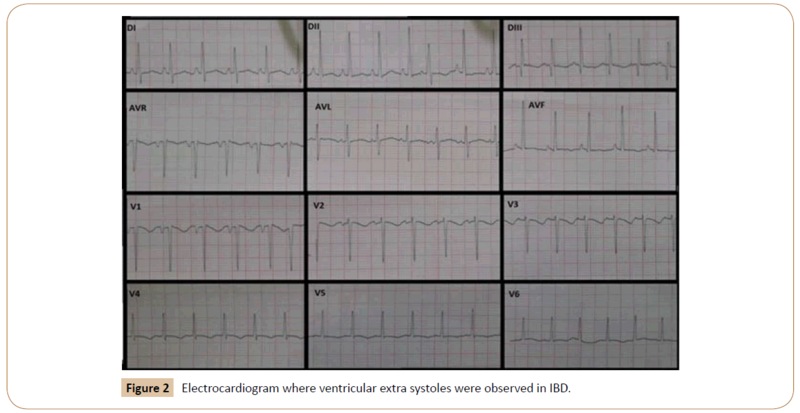 Figure 2: Electrocardiogram where ventricular extra systoles were observed in IBD. Patient continues to be critical with improvement of paroxysmal episodes of tachyarrhythmia, maintaining distal perfusion, without signs of low expenditure, in the control paraclínicos shows hypocalcemia by which it begins to replace it until corrected and reaches normal parameters. Patient with a tendency to respiratory alkalosis is modified respiratory parameters continuous well perfused supporting milrinone 0.5 μg/kg/min. A control echocardiogram is performed, which shows a slight increase in ejection fraction (FE: 36%), left cavity dilatation, significant global contractility involvement, pulmonary pressure: 25 mmHg; Carvedidol is established for dilated cardiomyopathy, carvedidol is subsequently discontinued because it is a nursing infant with digoxin with a 30 mg/kg impregnation dose during the first 24 hours and 10 mg/kg/day and enalapril. Patient after overcoming critical condition with low ventilatory support bilevel mode without desaturation with sedation, inodilator and beta-blocker-vasodilator, with ventilation to avoid increasing cardiac output and increase decompensation, improves ejection fraction, continuous hemodynamic stability, which is why it is decided Extubation without difficulty tolerating ambient oxygen, evolving positively for which it is discharged from PICU, currently under strict control monitoring by external consultation with satisfactory evolution without drawbacks. Acute myocarditis is an uncommon complication whose etiology is related to influenza virus. Clinical expression varies from asymptomatic to fulminant myocarditis, resulting in severe hemodynamic dysfunction. A case of acute myocarditis associated with influenza B is presented to highlight the importance of this virus as an etiological agent, describing the clinical course, emphasizing the importance of diagnosis, the help of images such as echocardiography, and exposing aspects related to the treatment and prognosis of myocarditis . Although the pathophysiology of viral myocarditis has been studied in experimental models and limited in human myocardial tissue, it is known that the inflammatory reaction in myocarditis of viral etiology is due to the direct damage caused by the virus or the antiviral immune response and is related to the genetic susceptibility of the host. It is now known that the cardiotropic viruses par excellence such as coxsackie B, echovirus and adenovirus 2 and 5 viruses share the same receptors on myocardial cells called CAR (coxsackieadenovirus receptor). Studies have shown that the expression of RACs is higher in the early stages of life and then decreases in the course of adult life. These findings may explain the susceptibility in the pediatric age to viral myocarditis. Direct damage to the myocardium mediated by viral invasion has been demonstrated by a protease that is encoded by the coxsackie B3 virus called protease 2A which has a proteolytic effect on dystrophin (actinbinding protein). In addition, protease 2A and 3C protease of coxsackie B3 viruses can induce apoptosis of myocytes. The interrelation between innate and acquired antiviral immune responses plays a very important role in the outcome of myocardial tissue virus infection. There are mechanisms that indicate innate response effectors such as TNF, nitric oxide, complement activation and toll-type receptors (which recognize molecular patterns associated with pathogenic microorganisms) may be involved in the induction of myocardial damage. Inflammatory infiltrate with an abundant presence of mononuclear cells, to the predominance of lymphocytes, in myocarditis lesions of viral etiology, reveals the extensive involvement of the cell-mediated immune response. The release of certain proinflammatory cytokines by helper T cells (Th1 and Th2) and the more recently described interleukin 17 produced by type 17 (Th17) T cells have been shown to increase the severity of myocarditis in animal models . The clinical presentation of fulminant myocarditis of viral etiology is characterized by nonspecific symptoms suggestive of viral infection, such as fever, cough, nasal discharge, nausea, vomiting, abdominal pain and diarrhea, accompanied by dyspnea, arrhythmia, syncope, insufficiency “Cardiac” and cardiogenic shock . The diagnosis of fulminant viral myocarditis is based on clinical and laboratory data, such as electrocardiogram, imaging (echocardiography, myocardial scintigraphy, and magnetic resonance imaging) and endomyocardial biopsy for histopathological analysis. The patient presented laboratory tests (significant: leukocytosis, elevation of CRP) and echocardiographic alterations. The clinical picture was preceded by flu-like symptoms, until respiratory failure, as a result of the viral etiology, with subsequent confirmation of influenza B.
Echocardiography is an important tool in the diagnosis of myocardial dysfunction and can exclude other secondary causes of heart failure, such as congenital heart disease and valvular or pericardial diseases, helping to identify the fulminant course of the disease. Classical findings include hypokinesia, with or without pericardial effusion variable degree of infarction dilation and atrioventricular regurgitation. In the echocardiographic evaluation of this patient, he presented 23% of the left ventricular dilated cardiomyopathy, excluding congenital defects, moderate mitral insufficiency due to dilatation of the ring, and indirect signs of pulmonary hypertension, with the initial treatment consisting of fluid replacement and vasoactive drugs. Regarding the treatment of acute viral myocarditis in the pediatric population, there are reports of a slight improvement in left ventricular function and increased survival with the use of high doses of intravenous immunoglobulin, but there is no consensus in the literature. In the case reported, the patient did not receive immunosuppressive or immunoglobulin treatment was based on intensive hemodynamic support, mechanical ventilation. Hemodynamic support is based on the use of inotropic drugs, and the need for vasopressor therapy in combination with inotropic therapy, which is common . The arterial vasoconstrictor norepinephrine is useful in cases of hypotension; however, it increases the consumption of cardiac oxygen without an increase in cardiac output. Epinephrine exerts an action similar to norepinephrine, but with an inotropic effect, particularly when used in low doses. In cases of pulmonary congestion, the use of intravenous diuretics should be considered. In the reported case, the diagnosis of myocardial dysfunction without hypotension is of choice milrinone as an initial vasoactive drug having ventricular dysfunction with an ejection fraction of 23%. Despite the intensive treatment, the mortality associated with fulminant myocarditis is high. Reporting a mortality rate of 39% for patients with fulminant myocarditis associated with influenza virus. Patients surviving fulminant acute myocarditis exhibit a favorable long-term prognosis, with good recovery of cardiac function, which reinforces the importance of adequate hemodynamic support in the acute phase of great cardiovascular instability. Influenza virus should be considered an etiologic agent of myocarditis; In cases of fulminant progression, the identification of signs and symptoms suggesting greater severity should be immediate, diagnostic aids such as echocardiography may be useful for the early detection of myocardial dysfunction and for treatment orientation. The use of immunosuppressive or antiviral therapy for fulminant myocarditis of viral etiology is controversial; Therefore, treatment is based on hemodynamics and ventilator support. The use of extracorporeal membrane oxygenation therapy (ECMO) seems promising but is not routinely used in underdeveloped countries. The presentation of this exceptional case is accompanied by a current revision of the subject, remaining as a reference; At present, there is little information in pediatric age of this pathology and more infrequent is that the etiology of influenza virus is type B and not A as found in the literature review which makes this case extraordinary. Swaminathan S, Jagadeesh A, Chandrasekaran V, Krishnamurthy S, Subramanian M, et al. (2015) Acute onset transient toe walking in a 4 yr. Old Boy due to H1N1 Influenza a Virus Infection. Journal of Pediatric Care 1:1. Osterhaus ADME, Rimmelzwaan GF, Martina BEE, Bestebroer TM, Fouchier RAM (2000) Influenza B Virus in Seals. Science 288: 1051-1053. Ukimura A, Satomi H, Ooi Y, KanzakiY (2012) Myocarditis associated with influenza A H1N1pdm2009. Influenza Research and Treatment. Saraiva Lobo ML, Taguchi A, Gaspar HA, Ferranti JF, Brunow de Carvalho W, et al. (2014) Fulminant myocarditis associated with the H1N1 influenza virus: case report and literature review. Rev Bras TerIntensiva 26: 321–326.